What is a DIY escape room? Escape room companies are taking off around the world, offering a unique challenge where players are “locked” in a room and have to find clues and crack codes to escape. This Science Lab Breakout escape room kit is a download that has everything you need to host the same kind of high-suspense, realistic-feel escape room, in any room you choose. All of the planning has been done for you. You just print, prepare, and host. Will this escape room kit work for me? It’s a great room if you want the feel of a commercial escape room, where your guests really feel like they’re locked in a room and trying to escape (and if you don’t mind doing some reading and setup). If you want something quick and easy that only involves printing things and doesn’t require a host, it’s not the room for you. But everything is pre-planned. If you can read, print, cut, and hide things, you can throw your own awesome escape room party with this download. Plus escape rooms are a ton of fun! Your guests will enjoy the searching, solving, and suspense that come with an escape room, as well as those great “a-ha!” moments when they finally figure out a clue. As a host, you won’t be able to play through the room, but it can be just as fun and rewarding to watch your guests play. Check out my newest escape room! This game consists of hidden clues in a room. Most clues are printed from the download. Some clues are physical objects you will need to provide, but they are all common household objects. There are very clear instructions in the download for preparing your room, where your guests will be “locked” and where they will search for and solve clues. The combination of printable clues and actual items makes the game more authentic and exciting for your guests. “Great job on the escape room! Our teens (Jr. high age) loved it and it was really easy to set up. The puzzles were interesting enough to keep the adults helping occupied, and it took the perfect amount of time. Thanks for a wonderful product!” – Meredith B. “I really loved the team building aspect and the plot was so entertaining! Great way to spend time with friends and family.” – Brenn G.
“Thank you for designing such a great escape room! I used it for my sister’s surprise party, and she and all her friends LOVED it! Thank you for making this a great, easy, stress-free experience!” – Michaela E.
“We ran the easy version for our daughter’s 13th birthday party last weekend. They loved it, and they escaped in 47 minutes with a few hints. Thank you!” – John M.
“My staff loved the activity. It was a great team building activity and so much easier than trying to take them to a different town for a true escape room.” – Jenna H.
“We had the first of three days that we are doing the escape room today for employee appreciation week at work. It was fantastic! Everyone loved it! It was a huge hit and we will likely do it again next year.” – Becky A. “It was great. Everyone had fun and it was easy to organise. Look forward to seeing if you’ll create any more!” – Terry B. “It went great! The party was actually last night for a group of 12 year old girls. They managed to escape the room in exactly one hour and only needed a little guidance to keep them on track. It was very well thought out and the instructions were very easy to follow. Much more economical then taking them all to an Escape Room. I will highly recommend your website to friends.” – Megan P.
“Thank you for the great game! We LOVED it! I purchased it for my 13 year old daughters birthday party and it was a huge hit! They insisted I use the hard version, so I did and used every tip provided for making it tougher, but hid a few extra hint cards for them. They ended up using 5 hint cards, and finishing in 56 minutes, even with her 2 year old sister in the room trying to ‘help.’ I was shocked they finished in under an hour! It was challenging for sure, but they had a ton of fun!” – Miranda W.
Also find a detailed review from Andy on his DIY Escape Room blog. This escape room kit lets you host your own DIY escape room at home. All of the planning has been done, you just need to print and prepare! The escape room takes place in a conference room or office, so the setting will be easy for you to recreate. 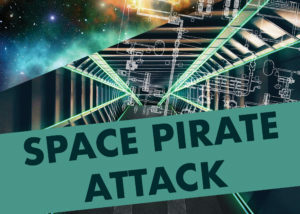 There’s an involved plot with a light science fiction theme, and it will be a lot of fun for your guests! Includes a digital download with over 20 pages of clues and detailed instructions, all of the planning and files you need to host your own escape room. I guarantee 100 percent satisfaction! If you’re unhappy with your purchase, email me within 30 days and I will offer you a full refund. I’m really excited to start releasing these new DIY escape room kits. I love escape rooms because they’re more than just a scavenger hunt or solving puzzles. It’s an immersive experience that puts you in a more real situation, increasing the excitement. Professional escape rooms are a lot of fun, but my belief is that anyone should be able to host their own escape room at home. If you have any questions, comments, or reviews, be sure to respond below! Also be sure to check out my Printables page for more great games to play! The escape room download has a no-commercial-use copyright attached. You are free to download and use for your own noncommercial purposes, but please do not share the digital files, post the digital files, or use any contents of the download to host an escape room you charge money for. Hi Paige, We loved your Science Lab Breakout Escape Room… so much that my teens are asking for another to do with their friends. I didn’t see other scenarios for older teens. Am I overlooking something? Hi Maria, unfortunately, I only have the one escape room for teens. The only other escape room I have is for kids ages 8-12. I have a couple of escape rooms for teens/adults in the works though! I hope to release them soon. I’m glad your teens enjoyed the game! We ran the Escape Room for our Girl Guides (aged 10-14) and they loved it. They are looking forward to the next one…. so please keep creating some. Having laminated the print outs, we are running it again with the older Ranger Guides (14-16) next week. Awesome, thanks, Kathy! I’m glad it was fun! If I wanted to use this for a kids summer activity, can the same printed set be used multiple times or do the escapees have to write or damage the printables? Thanks! Some clues can be used again, and some are designed to be written on. But if you laminate these clues and provide plenty of scratch paper for your players to write on, you could use them again and again. Hi, Do you think this game is too hard for 10-12 year olds? I recommend it for ages 12 and up. If the 10-12 year olds have adults in the room playing with them, I would say it would be OK. For 10-11 year olds by themselves, I wouldn’t recommend it. 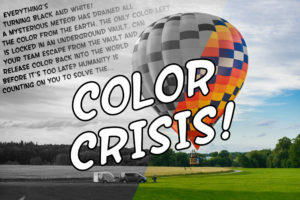 I do have a children’s escape room called Color Crisis. Hope this helps! Thank you for your reply! Not sure how I missed it. Hi Omar, I’ll send you an email with some details. our group isn’t quite that large, but if you could share those details with me for our group of about 50 I would appreciate it. Thank you! I have a large group about 150 that is like to do this with as well. Is it possible? There are several ways you could go about it. I would divide into about 15 groups with about 10 players each. You could set up several rooms and take turns, resetting up the room between groups. Time each team and compete for the shortest time. You could also (if you have space) set up 15 rooms at once. If you don’t have 15 rooms, you can do more than one team at a time in a large room as long as the teams have their own table to work at and aren’t close enough to each other to eavesdrop. Would any of those options work for you? is there a way to play this game without an internet connection? Yes, Becky, the game comes with printable pages you can use instead of the Internet if you need to. Hi – Just wondering for the Science Lab Breakout escape room, how much time average should I allow to complete? I would love to use this for a small team meeting at work. Thanks! I would allow for about an hour, Darlene. Hello I have a group of 40 people, what’s the best way to go about doing it? Thanks. Hi Andrew, there are a few ways you could go about doing it. You could divide into 4 or 5 groups, set up one room, and take turns. Time each group and compete for the fastest time. You’ll just need to re-set up the room and replace some of the clues between teams. You could also run 4 or 5 rooms simultaneously, if you have a big building and that many spare rooms. Try to set up each room identically and have the teams compete to see who can break out fastest. Send me an email at [email protected] if you want to talk about it in more detail. I am looking for an escape room activity for a group of students who are learning English to create a lot of discussion. They have a fairly high level of English – do you think would this be suitable? Only you can say for sure. If they have a high level of English, it could work! It will definitely create a lot of discussion. I have a complete satisfaction guarantee policy, so if you download the kit, look it over, and decide it will be too difficult, just let me know and I’ll give you a full refund. Hello, I intend to have an Escape Room in French, is it possible for me to modify the language on your pages? And how many kids at the time can we have for this activity? Hi Nancie, I don’t think it would be possible to translate into French. There is a lot of text, and there are passwords for a website in English that can’t be changed. For numbers of kids, I would say 10 at the most. We just did the Science Lab escape room in my “Game Design” class in summer school for 13 5th-8th grade students. They LOVED it! I was a little worried that the difficulty would be too high for them, but older kids helped out and it worked really well. They loved the theme and we even got to do it in the actual science lab at school. The easy version worked PERFECTLY for us. I had fun setting it up and getting the kids into theme. I only wish that you had more! Thank you! Thanks, Amanda! I’m so glad it went well! Is there anyway to set it up with 7 or 8 groups of 5 students doing it at the same time in a science classroom? Hi Sharon, it could be done. Each group will need their own clues/props. The biggest concern I’d have is making sure groups can’t overhear or cheat off of each other. It would be best if each group were at their own table. No, the files aren’t editable. Sorry! I did this escape room for my sons (I have two the same age) birthday party….they were turning 11. I didn’t have enough room for all 11 guests to play together, plus I thought some kids would get bored if they weren’t all doing something, so I split up the game into two rooms. In one room I had all the blueprint clues. In the other room I had all the security alarm clues. I sent one team to each room…once they accomplished the goal of that room, they all came to the kitchen for pizza while I reset the rooms. When I reset them, I added the additional clues they would need for the lock to both rooms. Then the boys switched rooms and kept playing until they escaped. I timed each team in each room and added the times together to determine the winner. It was SO fun! If I could do it again, I would hide the clues in easier places….it took the boys longer to escape than I expected (I did give lots of little hints). They really didn’t tear apart the room like I thought they would. Your files and instructions were SO organized and easy to follow. I plan on doing this escape room again with the teenagers from our church and I definitely plan on checking out your other rooms as well. Thank you for a fantastic product! Thanks, Rachelle, I’m so glad it went well! That’s a super smart way to run the room with two groups. Great job! Is this something that I can use part of the kit for an office retirement party? I am looking for games that people can do to figure a few things out while eating and mingling. They would not have the full time to devote to everything. I’ve never heard of anyone do it that way. You could try! You can definitely set it up that way. I’m just not sure how distracting it will be for people; if they’re easily able to mingle and play at the same time. Just finished the Science Lab Breakout for my son`s birthday, it took almost 2 hours for 3 of them (12 years old) to finally escape but they did it and loved it! They were set against using the hint cards and only used one. I hid the combination for a lock on the wall with glow in the dark paint. I love the glow in the dark paint idea! I’m so glad it was a success! I just read through the instructions. I don’t want this to be too easy, nor too hard! Is it possible to use some easy clues and some hard clues? Using this with 13-14 year old boys who are all smart. Hi Tracey, yes, it’s possible to pick and choose which easy clues and which hard clues you want to use. Great question! My best advice would be to read through both the easy and hard clue instructions and use what you want from both versions to customize the game. The clue instructions also have additional ideas for making the game harder. Hope that helps! Is there a way to incorporate actual locks and such (have to unlock a box first to get the clues) as they do in real escape rooms? Yes, absolutely. The kit includes clues to cut out and hide throughout the room. You can hide them in any way you wish, including in other locked boxes. 1. Can the printables be bought in other languages than english? 2. If not, can the printables be translated into Spanish by me? I mean, are they made on vector documents that can be edited (for example in Adobe Illustrator) to be translated? 3. And also, even if I can translate, are the clues too much “language dependent” so that they cannot be well adapted to another language? So, unfortunately, the games are only in English. And the files are all PDFs and are not editable. Sorry! Would this be good for 9-10th graders? Wanting to do a youth group escape room. Yes, the easy version would be great for 9-10 graders. Hi there! I’m so excited to run this escape room with my daughter’s softball team this weekend. If I only have access to black and white printing, will that screw up the hints? Obviously I can go to a printing store if it’s absolutely necessary. Thanks. Nope, it won’t mess up anything. The quality won’t be quite as nice, but everything will still work! Would this work in a classroom of 5-8th grade students? Yes, the easy version should be great for that age group. You’ll just need to divide the classroom into groups of 5 to 8 students. I’m looking to do this for a staff party at an elementary school. The problem is they only have about 30-40 min to play a game but the description says it takes an hour. Any chance there’s a way to make it faster? Yep! Use the easy version of the game and don’t hide any clues at all. You can also color-code the clues or group them by section to make it even easier. (This makes the most sense once you’re looking at the game. Email me at [email protected] if you want to go over specifics.) But yes, totally doable!